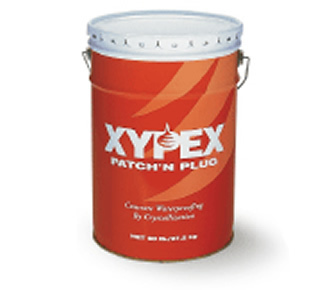 Xypex Patch'n Plug is a specially designed, fast-setting, non-shrink, high-bond-strength, hydraulic cement compound for concrete patching and repair. Patch’n Plug stops flowing water in seconds and is used to seal cracks, tie holes, and other defects in concrete. The high performance characteristics of Patch’n Plug are enhanced by Xypex’s unique crystalline waterproofing technology. Xypex Patch'n Plug, Concrete waterproofing, is available in 9.1 kg pails and 60 27.2 kg pails. One 27.2 kg pail of Xypex Patch’n Plug will produce 0.0154 cu. metres of mortar. 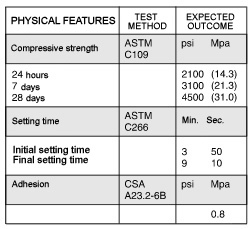 Note: Samples prepared with 1 part water to 3.25 parts dry powder by volume (1 part water to 4 parts dry powder by mass). Setting time was determined using Gilmore needles. Rout out crack or hole by chiseling or chipping to a minimum depth of one inch (25 mm). Form a square or dovetail shaped space (do not use a “V” cut). Flush away all loose materials and dirt from the cavity with water and a stiff brush. Add 1 part water to 3.5 parts Patch’n Plug by volume and mix to the consistency of a stiff putty. Do not mix more than can be used in 3 minutes. For best results, water temperature should be approximately 60ºF - 70ºF (15ºC - 20ºC). 3. Plugging form plug with gloved hand. Place plug into cavity pressing firmly until plug is hard. When sealing cracks, begin at the highest point and work down. Where there is a high water pressure flow, form mastic with rubber gloves and wait until it is almost hard before bring it into the water flow, then press down firmly until mastic it has hardened completely (3 min.). NOTE: Where there is a high volume of water flow due to extreme hydrostatic pressure, follow these steps: With a concrete chisel and hammer (or chipping gun), cut open a cavity at the point of greatest water flow. a) Place a stiff section of hose or pipe into the cavity and secure in place with Patch’n Plug to force water through the hose. This relieves the pressure so that the area can be patched. Allow a minimum of 24 hours for hardening. b) Remove bleeder hose and plug remaining hole. If necessary, reduce water flow by inserting steel wool or wooden plug in the remaining hole before patching. For more instructions, alternative application methods, or information concerning the compatibility of the Xypex treatment with other products or technologies, contact the Technical Services Department of Xypex Chemical Corporation or your local Xypex representative.